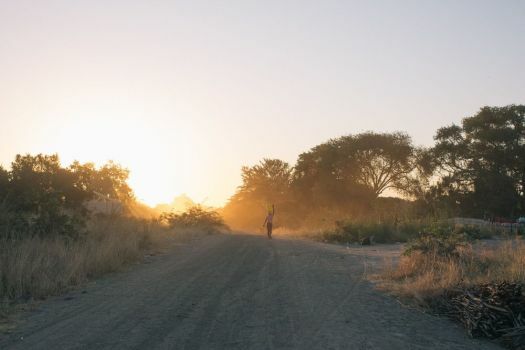 A new missions experience in Namibia is not as much a programme as it is a journey. Instead, the couple is taking a journey, and they are inviting others to come alongside. The Luke 24 Journey is a one-month programme designed to help people interested in mission work gain clarity and direction, and the van Vuurens are calling it a journey, not only because of the journey two men take to Emmaus with Jesus in Luke 24, but also because the couple see themselves as taking one more step in their journey of faith. As a result, both Japie and Ronel expect this new programme, which launched in September 2017, to be as much a learning experience for them as for the participants who come in from the outside. While it is modelled on other OM Africa discipleship programmes, such as Missions Discipleship Training (MDT) and the Africa Trek, it’s different in that it has no set schedule, which Japie says will hopefully allow students to focus on fellowshipping with God and clarifying the direction in missions they want to go. That was certainly the case in September, when their first Luke 24 Journey took them and two students around Namibia with no plans other than to hear from God and follow Him each day. Just as Jesus used all of Scripture to explain those things about Himself to the two men on the road to Emmaus, so also the Luke 24 Journey emphasises a chronological teaching of Jesus, from Genesis to the book of Acts. But even the teaching, Japie says, is not the type of classroom setting you would expect in a discipleship programme. All of the learning, as with the practical outreaches, is on-the-go. Case in point: For their first Luke 24 Journey in September, Ronel says that the only preparation she and Japie made was getting a ride to a local farm and “starting” the journey there. Beyond that, the programme was as open as the horizon. On the first day, they took the two participants—a Namibian woman and a man from Switzerland—shopping for food. While the fluid schedule of the Luke 24 Journey has quite an appeal to those looking for clarity in their relationship with God through missions, Japie says that it “wasn’t all easy going”—meaning both the first journey and all the planning leading up to it. The process of defining what Luke 24 Journey would be was years in the making, as Japie and Ronel wrestled with their own understanding of what an effective discipleship programme looked like. And even though the journey itself gave plenty of little challenges for the team of four, Ronel says the flexible schedule also allowed for the building of community. The next Luke 24 Journey will begin February 4, 2018, and last one month. All of the journeys will be one month, Japie says, and the couple is planning on facilitating several each year. Five have already been scheduled for 2018. The one-month window, Japie says, will allow anyone to participate, without the pressure of committing to a three- or six-month programme. People on holiday, students and anyone else with four weeks to spare will find an opening with the Luke 24 Journey. And no two journeys will be alike. “I’m excited about what I can still learn,” Ronel says.